FINALLY won his first Golden Globe. He has been nominated numerous times but never won. He beat Jack Nicholson, Brad Pitt, Mark Wahlberg and Ben Affleck. He has done comedy, animation, action and now drama. Maybe he finally found his niche. Either way, I am happy for the guy. I BLOGGED SAYING HE WON AND NOBODY CORRECTED ME!!! HE LOST, AND WAS A POOR LOSER AT THAT... Sorry Eddie! What the hell is a FEED READER?? RSS fees, RSS reader, Feed Burner?? This is a useful tool if you want to start a network of readers. If they subscribe to your feed then they will visit your site often for new content. The more subscribers = more visitors = more readers = MORE TRAFFIC TO YOUR BLOG. Make sense?? How do you subscribe or sign up for a feed reader? You can register at http://google.com/reader or you can use RSS OWL. Either way, subscribe to one of them. Nutang has an RSS address in the modules. Use that module and publish it to your left side or right side module. People can then subscribe to you. You can use your google reader to read the feeds YOU subscribe to. Another tip.... FEEDBURNER.com will help you burn your feed and get the "spiders" to crawl your page. Kiefer Sutherland, star of 24 will be in an upcoming animated adventure called Dragonlance: Dragons of Autumn Twilight. He will be the voice of Raistlin Majere. This story is about wizzards,magic, a princess, a barbarian protector and yes of course, a dragon. Have any of you read the book, "If you give a pig a pancake" or the book "if you give a mouse a cookie"? Well, they are the same principle and that is what I want to blog about today. My boss is soooo stupid. This is the reason why I HATE my job. She gives me MORE work when I ask for help and just does not make logical decisions. She creates more work for everyone involved. Just today she asked me to open my office when I am scheduled to be closed. She said because it is close to the deadline that I need to keep my office open. Well all the applications are ONLINE why would anyone be walking in the door on a day that we are ALWAYS scheduled to be closed?????? "IF YOU GIVE YOUR BOSS A BRAIN"
Then she comes parading into my office with 5 students telling me, with this huge smile on her face, Kahea, I brought you some students to apply for scholarships.. (ok, I am helping one student on the computer and one on the phone, I cant talk to you right now) I said, "ok, I will be right there, when I am done on the phone." She then tells these rowdy student, "would you like a donut? We have donuts next door." Well, these donuts were purchased by some of us as a TREAT to all the office workers. It was a perk or benefit for the workers not for her to give away at her liberty. She didnt even buy them. She then comes back with these donuts that she did not buy and says, "here you go, a donut AND a scholarship" Huh? You dont get a donut for applying for a scholarship. What about the 1200 other people that applied? You got a donut for them too??!! "IF YOU GIVE YOUR BOSS A BRAIN"
On top of that, one of the students came back and said, "Can I have another donut" You see what I mean.... "If you give a mouse a cookie"??? I read about payperpost from Kirei's blog. I became interested when I saw that you could earn money through this affiliate program. I am always looking for new ways to increase traffic to my blog as well as making some cold hard cash! Hollywood.com reported that Britney Spears father, Jamie, has spoken out about his daughters recent troubles, calling her a sick little girl. Spears father, who, like the Toxic singer, has also sought rehab help, was seen with his daughter when she initially checked into the Promises Treatment Center in Malibu, California, on Tuesday. The pop star was spotted having dinner with her father on Sunday, when he reportedly pleaded with her to get professional help. Jamie Spears tells Fox News the problems she is facing are not about what other people think. 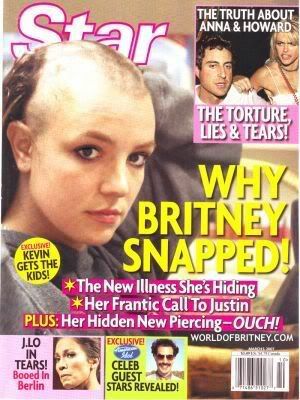 He says that he and Spears mother are concerned about our daughter, adding the troubled pop star is sick little girl. He says, "We are just trying to take care of her." Technorati is one of the best traffic providers for bloggers. It makes your blog much easier to find when people search by technorati tags. Technorati is also a large blog ranking engine. Based on the number of links to your blog from various websites, your blog is given a rank. The higher your rank the easier your blog is to find when people search for things. A higher rank gives your blog greater credibility in technorati. If you don’t already have a technorati account, get one. After you have setup the main settings, such as your profile, you need to claim your blog. Go to Account and then down the page to Your Blogs. Enter the URL of your blog in the URL field and then hit “Claim this weblog.” Once you’ve done that go to “Configure this Blog” and fill in what you can. Click the checkbox to select “Include this blog in Technorati’s Blog Finder” and fill out as many tags or keywords that accurately represent the content in your blog. When you’ve done that, click “Save Changes” and then grab your claim code. There are two types of codes that you may put somewhere in your blog for technorati to verify that your blog exists and keep track of it. If you have a blog that is Blogger powered or some other blog host that does not give you direct control of your blog files you will want to use the “Link Code” and post it somewhere on your blog. If you are using a more versatile blog publishing system, such as a custom WordPress or Movable Type installation you should copy the “Embed Code.” You can edit your sidebar, header, or footer file and put it wherever you like. You also have the option of posting a Technorati search box or various links on your blog without altering the code you just pasted. Select the options you like and click “Save Changes.” Everything is done by automatically by Technorati. One last thing you might consider is adding the Technorati ping link to your weblog. Doing this will let Technorati know when you have updated your blog. Find out how to do that on Technorati’s Ping Configuration page. A friend of mine recently told me that he went speed dating with a friend. I was like, "huh?" He said he had a lot of fun and there was no pressure. Everyone is there for the same purpose, to find a date. After 10 min. if you are not interested in eachother, "NEXT" and you switch! It is that simple. Wondering if Speed Dating is for you? Here's all the basics to help you determine if you want to give Speed Dating a try. Speed Dating originated in the late 1990's and utilizes a round-robin format to help daters meet several people one-on-one at the same event. Each date typically lasts ten minutes or less before you move onto the next potential mate.